I've finally decided to embrace fall (even though the NYC weather is still summer-like) and this past weekend celebrated by doing some Fall-AF activities. On Saturday I attended an event with The Feed Feed and Vitamix that featured a DELICIOUS Fall-themed brunch. I'm excited to share the recipe I made for the brunch soon! Sunday morning I woke up at 4 am (ARG!!!!) since Pat had a super early flight to Los Angeles. Unfortunately, living in a tiny apartment means that when one person is awake, the other person is most likely also awake. I decided to take advantage of my early day and made three(!) kinds of caramel because my sister and our friend, Nica, were coming over so we could make caramel apples. A couple hilarious and very messy hours later, the caramel apples were completed and decorated. Then I made a pumpkin-butternut squash soup and brought it over to their apartment later that evening so we could CARVE A PUMPKIN!!! Guys, I honestly cannot remember the last time I carved a pumpkin. Definitely not since I have moved to New York. It was really hard - I was sweating after carving the face out. But it was so fun! It was nice to take advantage of the season and be spontaneous. Speaking of pumpkins, today is the VIRTUAL PUMPKIN PARTY! 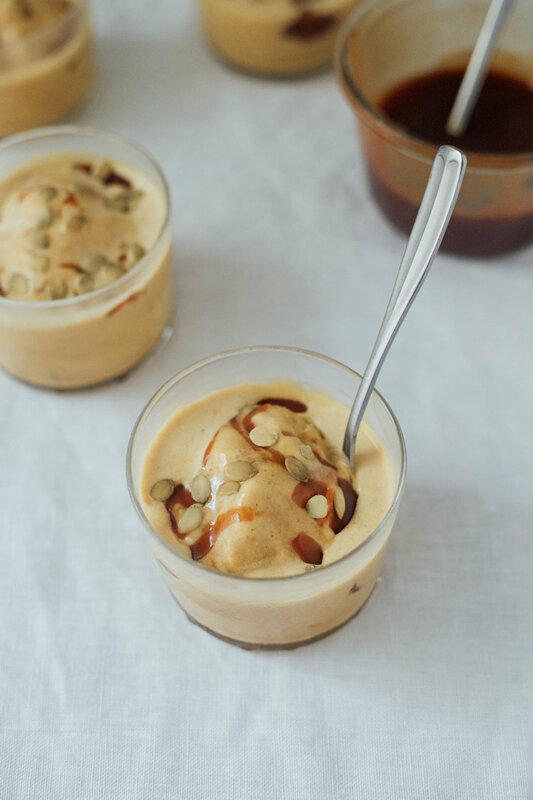 I'm so excited to be participating with my Pumpkin Ice Cream with Salted Caramel Swirl. 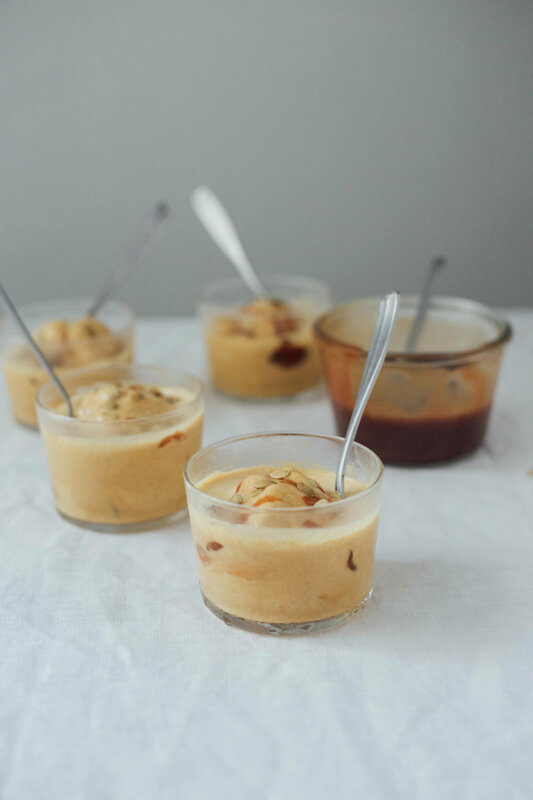 Developing this recipe was so fun and it was unlike any ice cream that I've ever tasted. Pumpkins are so versatile and I always forget that recipes can be made with them besides your typical pumpkin pie. Check out all of the other delicious recipes in the link above! This ice cream is SUPER decadent and rich. Think pumpkin pie on steroids. Seriously, the flavors were so intense and dreamy! Adding a salted caramel swirl notched it up even further! Check out all of the recipes from the Virtual Pumpkin Party. Freeze the ice cream maker according to the manufacturer's instructions (I use cuisinart and I need to freeze it about 24 hours beforehand. In a large stainless steel saucepan, combine the pumpkin purée, milk, cream, spices, in salt. Set the mixture over medium heat, and bring to a boil. Once it gets to a boil, immediately remove it from the heat. In a smaller metal bowl, beat together the egg yolks and sugars until light and airy. Pour one cup of the warm pumpkin mixture slowly into the egg yolk mixture to temper it, stirring constantly. Pour the tempered yolk and pumpkin mixture back into the saucepan with the rest of the cream batter. Cook over low heat, stirring with a heatproof spatula, until the custard thickens significantly. Remove the pan from the heat and transfer custard into a heatproof glass bowl. Let the custard cool to room temperature, stirring occasionally. Refrigerate for at least 2 hours, or overnight. Once chilled, transfer the custard to an ice cream maker. Freeze according to the manufacturer's instructions. On the last churn, add in 1/4 cup of salted caramel in a slow stream. Serve immediately if you prefer soft, creamy ice cream. For firmer consistency, transfer the ice cream to an airtight container and freeze for about 2 hours.